TheGunBlog.ca — The Canadian government is considering changes to gun-storage laws in addition to firearm bans and other restrictions on hunters and sport shooters, the Kenora Daily Miner & News said in a report quoting Bill Blair, the minister examining prohibition. Blair was in Kenora in western Ontario on Nov. 30 to meet with Member of Parliament Bob Nault to discuss firearms, crime and other topics with local groups, the newspaper reported today. The prime minister instructed Blair in August to examine a “full ban” on handguns and what he called “assault weapons.” Blair is meeting with individuals and groups across the country as part of his review. Blair was recently tasked with examining “steps we might consider with respect to firearms, particularly handguns,” he said. That includes looking at a handgun ban and possible changes to legal firearm storage. The newspaper didn’t provide further details on the storage changes. The editor of TheGunBlog.ca attended one of Blair’s consultations in Toronto. Participants at a few meetings recommended the centralized storage repositories sought by Toronto Mayor John Tory, without this necessarily being a government goal. Update Dec. 5: The Ministry of Public Safety didn’t respond to a request from TheGunBlog.ca on Dec. 5 for comment. Canadian government is considering changes to gun-storage laws in addition to gun bans, Kenora Daily Miner & News reports. 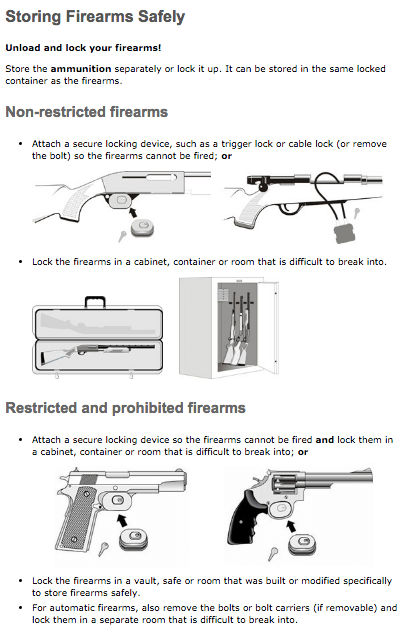 Now: All guns must be locked in a safe or disabled for storage. Hunting is at the core of Canadian heritage and culture, and target shooting is one of the country’s safest and most-popular sports. More than 2 million men and women have federal licences to own in excess of 10 million rifles, shotguns, pistols and revolvers. Warehouses and shops also store tens of thousands of firearms. The law says firearms must be stored unloaded, disabled in some way and locked in a safe, depending on their legal classification. Storing guns and ammunition safely in a way that isn’t in the law can lead to confiscation, prison or both. Toronto Mayor Tory asked the federal government in August to eliminate home storage and create centralized “repositories” for all firearms if it didn’t ban all handguns. He was re-elected as mayor in October after campaigning to prohibit all handguns and all semi-automatic firearms from all hunters and sport shooters in Canada. Update Dec. 5 at 17:50 Toronto time: Adds absence of a response from Ministry of Public Safety. Update Dec. 5 at 09:50 in Toronto: Adds Toronto mayor’s request for gun repositories.